My practice includes estate planning, probate, real estate, and municipal work. I strive to make the estate planning process comfortable and straightforward to our clients by effectively learning and implementing their needs and desires. I am able to use my skills as an educator to effectively communicate legal concepts, which empowers our clients to make informed decisions regarding their estate planning. My experience also includes representing clients’ interests in complex and contested guardianship proceedings and pursuing former fiduciaries to recover for the estate. I was privileged to garner significant experience as a leading contributor to Wills for Heroes, a program that creates basic estate plans for Ohio’s police and firemen. With personal experiences as a tenant, a landlord, and as a large-complex property manager, I seek to achieve my clients’ interests in personal and commercial real estate matters from leases to litigation. I have represented diverse interests in real estate-related litigation, enforced various types of liens, and handled complex contracts related to development and construction. Prior to joining Metz, Bailey, and McLoughlin, I practiced for a statewide firm exclusively representing condominium and home owner associations. I advise our firm’s municipal clients on all matters related to the operation of a successful government, including sound economic development practices, compliance with Ohio's Sunshine Laws, legislative drafting issues, government contracting, and property and zoning matters. I have served as a guest lecturer for the Elected Officials Academy, conducted by the Center for Public Administration and Public Policy at Kent State University. 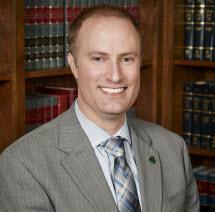 Previously, I simultaneously assisted law directors of six municipalities in the Dayton area. On a personal note, I am an active member of the Knights of Columbus and Westerville Sunrise Rotary. I enjoy travelling with my wife and children, and following my favorite baseball and college basketball teams. I am an Eagle Scout and during law school, I spent a summer working and studying Irish and European Law in Dublin, Ireland. Although I was born and raised in the northeast, I have been proud to call Ohio home for almost 20 years.